Iran and America entered a new and intense phase of word-slinging and trash-talking this week. Wars of words can sometimes lead to shooting wars or they can raise the stakes so high that negotiations become necessary to skirt conflict. Which will it be with Iran? Future talks or terror? 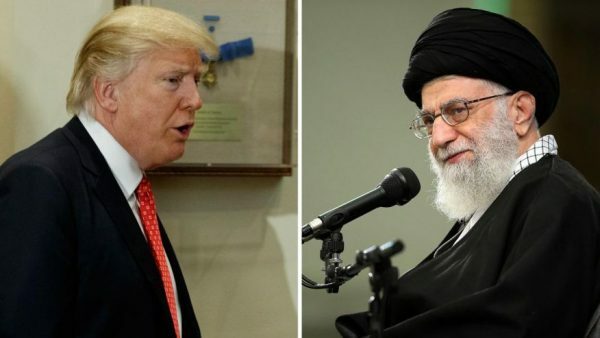 President Trump sees it only one way: “Iran has to come back and they have to talk,” he said at Wednesday’s press conference. For him, Iran’s precarious domestic conditions combined with America’s external pressure give Iran only one choice. His recent experience with Kim Jong Un informs and reinforces his firm belief that these Axis of Evil nations have no choice and no better partner for negotiations than this administration. North Korea and the leader formerly known as “Little Rocket Man” show that a nuclear high-stakes negotiating style can lead to a peace process and a Singapore junket. It’s never guaranteed, of course, and failure could have led to a smoldering Seoul. The good news? His gambit led to renewed dialogue and de-escalation on the Korean Peninsula. President Trump is now using the same negotiating style he deployed on North Korea with a big, bad but nuclear-weapon-free Iran. Trump’s United Nations appearance may have been laughable in some quarters, but his on-stage tenor was no joke. He put Tehran on notice that, as John Bolton put it, there will be “hell to pay” for continued misbehavior at home and on the international stage. Iran’s President Rouhani is following Kim’s initial playbook, saying that Trump had a “Nazi disposition.” Not as subtle as Kim’s 2017 “dotard” comment, but the effect is the same. Bombs and rockets may break American bones, but names will never hurt Trump. He’s heard it all. He’s said it all. Interestingly, it was the Obama administration’s strong and effective economic sanctions strategy that initially brought Iran to the Geneva negotiating table. Trump is trying to follow the same carrot-and-stick approach with an extra added “fire and fury”-type threat unique to the current White House occupant. The stick? Sanctions. The carrot? Negotiations and normalization. The Obama-era JCPOA nuke deal was only possible because the Iranian regime was politically faltering and economically devastated, feeling the sanctions pressure not only from American allies but also from China and Russia. The sanctions regime was a controlled and concerted effort that Iran knew it could not sidestep or end run. Beleaguered Iranians hit the streets, with protesters looking in vain for an outlet to express their frustration. The Iranian theocratic regime recognized it was in trouble. Sanctions worked. The result, however, was an imperfect JCPOA deal. Obama operated under the assumption that the Iran nuke deal was a significant step — but only a first step — towards peacefully enticing a burgeoning moderate Iranian political class. He saw the verifiable nuke deal as an initial confidence building measure. The goal was to turn Iran into a norm-abiding, peace-promoting member of the international community of nations, one that exported cheap oil, not bloody violence. Donald Trump was having none of this. He didn’t believe you could buy Iran’s compliance or co-opt its leaders without a more comprehensive agreement. He felt Obama gave away all his leverage. Trump ripped up the deal. Now we’re on the verge of Sanctions 2.0 — the Trump Edition. The difference between the Obama and Trump sanctions-led approaches, however, is significant. Obama’s State Department had built an air-tight coalition of allies and adversaries who worked together to isolate and effectively bankrupt Iran. Trump, on the other hand, has alienated some allies and tweaked economic foes. His fair-trade demands and tariffs play poorly abroad. Instead of foreign nations lining up to support an American-led sanctions regime, European allies figured out how to skirt Iran’s economic isolation, designing a “Special Purpose Vehicle” (SPV) to facilitate financial transactions and bypass both restrictions and punishment. An SPV undermines a global united front against Iran. Trump is coming out of a Singapore summit with a self-declared victory with his new favorite dictator, Kim Jong Un — a man of “courage.” Trump now wants to take the premature lesson of this anti-pyrrhic North Korean victory and apply the same type of maximal pressure on Iran that he feels worked with Kim. Unlike North Korea, Iran is a former empire with a much larger population and plenty of energy resources and regional influence with ostensible American allies like Iraq. Iran rejects Trump’s unappetizing carrots and scoffs at America’s sticks, threatening to use its own stealthy and regionally subversive sticks in response. Tensions are rising. Most leaders don’t play with literal fire in a high-stakes games of diplomatic chicken because miscalculation can lead to deadly consequences. Trump, however, relishes the game. Let’s hope his bet pays off.